A prostatic core biopsy showing a focus of atypical small acinar proliferation (ASAP) suspicious for, but not diagnostic of, cancer (arrow, A). A repeat biopsy in the proximity of the same site shows another focus of crowded small-caliber glands (arrow, B), which, on immunohistochemistry with the basal cell marker 34βE12, reveals absence of basal cells, thereby confirming a diagnosis of adenocarcinoma Gleason 3+3 (arrow, C). Such foci are found in approximately 2-5% of prostate needle biopsy specimens. ASAPs are located most often in the peripheral zone of the prostate; they are rarely located in the transition zone. ASAP suspicious for malignancy discovered after prostatic core biopsy is highly predictive of subsequent prostatic adenocarcinoma on repeat biopsy, with a reported range of 17-60% of cases. [1, 2] Schlesinger et al found prostatic adenocarcinoma in subsequent biopsies in 23% of cases after prior diagnosis of high-grade prostatic intraepithelial neoplasia (HGPIN) alone; in 37% after diagnosis of ASAP alone; and in 33% after prior diagnosis of HGPIN with contiguous or noncontiguous ASAP. Although the predictive value of HGPIN for cancer fell from 36% in older series to 21% in newer series, the predictive value of atypical small acinar proliferation was nearly constant. 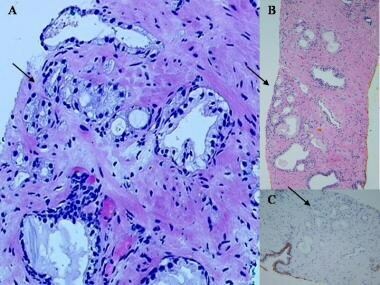 The etiology of ASAP suspicious for malignancy reflects that of prostatic acinar adenocarcinoma. The implication is that some of these foci really represent underlying adenocarcinomas that are not diagnosable with confidence on core biopsies because of qualitative or quantitative criteria falling below a threshold for malignancy. No specific genetic information exists for ASAP per se, although those cases of ASAP that represent underdiagnosable cancer would indicate a similar molecular genetic profile as acinar adenocarcinoma. All ASAPs are either marginally sampled cancer or benign acini with reactive atypia or atrophy. Thus, the epidemiology of ASAP overlaps that of prostatic acinar adenocarcinoma. Atypical small acinar proliferation (ASAP) was found to differ significantly from minimal cancer in several respects. Among architectural findings, ASAP foci averaged 0.4mm, versus 0.8mm for minimal cancer. In addition, ASAP was found to have a mean of 11 acini, versus 17 acini for minimal cancer. ASAP was more frequently diagnosed if the cytology was confounded by excessive nuclear hyperchromasia (44% vs 9%) and demonstrated less nuclear enlargement than minimal cancer. According to Iczkowski et al, enlarged nuclei (88% of cases) with prominent nucleoli were found in at least 10% of cells (55% of cases), luminal mucin in 6% of cases, proteinaceous secretions in 33% of cases, adjacent atrophy in 59% of cases, stromal fibrosis in 21% of cases, and amphophilic cytoplasm in 18% of cases. Adjacent high-grade prostatic intraepithelial neoplasia (HGPIN) was noted in 42% of cases. Chronic inflammation was more commonly found (64% of cases) than acute inflammation (21% of cases). Immunohistochemistry can assist in reducing the incidence and ambiguity of atypical small acinar proliferation (ASAP) diagnoses. A high-molecular-weight keratin (34βE12) and the equivalent cytokeratin 5/6 stain the basal cell layer of prostatic acini. A nuclear marker of basal cells, p63, has the same ability to decorate basal cells. Their presence, as confirmed on immunohistochemistry with these antibodies, almost definitely rules out carcinoma. However, absence of basal cells does not always indicate carcinoma, as benign acinar proliferations that mimic carcinoma (for example, adenosis and partial atrophy) can demonstrate patchy basal cells that result in some glands in these conditions being devoid of a basal cell lining. Alpha-methylacyl-CoA-racemase (AMACR; P504S) has emerged as a positive immunostain to diagnose cancer. However, AMACR is also positive in high-grade prostatic intraepithelial neoplasia (HGPIN). The high predictive value of ASAP for subsequent adenocarcinoma indicates a need for repeat biopsy. [13, 14] Cancer is found in a different sextant site from the initial ASAP site in 39% of patients, suggesting that repeat sampling should include multiple sites of the gland. However, also concentrating repeat biopsy sampling at the site of ASAP, knowing that such foci often represent marginally sampled cancer, may also be prudent. Bostwick DG, Meiers I. Atypical small acinar proliferation in the prostate: clinical significance in 2006. Arch Pathol Lab Med. 2006 Jul. 130(7):952-7. [Medline]. Montironi R, Scattoni V, Mazzucchelli R, Lopez-Beltran A, Bostwick DG, Montorsi F. Atypical foci suspicious but not diagnostic of malignancy in prostate needle biopsies (also referred to as "atypical small acinar proliferation suspicious for but not diagnostic of malignancy"). Eur Urol. 2006 Oct. 50(4):666-74. [Medline]. Schlesinger C, Bostwick DG, Iczkowski KA. High-grade prostatic intraepithelial neoplasia and atypical small acinar proliferation: predictive value for cancer in current practice. Am J Surg Pathol. 2005 Sep. 29(9):1201-7. [Medline]. Iczkowski KA, MacLennan GT, Bostwick DG. Atypical small acinar proliferation suspicious for malignancy in prostate needle biopsies: clinical significance in 33 cases. Am J Surg Pathol. 1997 Dec. 21(12):1489-95. [Medline]. Iczkowski KA. Current prostate biopsy interpretation: criteria for cancer, atypical small acinar proliferation, high-grade prostatic intraepithelial neoplasia, and use of immunostains. Arch Pathol Lab Med. 2006 Jun. 130(6):835-43. [Medline]. Jiang Z, Li C, Fischer A, Dresser K, Woda BA. Using an AMACR (P504S)/34betaE12/p63 cocktail for the detection of small focal prostate carcinoma in needle biopsy specimens. Am J Clin Pathol. 2005 Feb. 123(2):231-6. [Medline]. Ng VW, Koh M, Tan SY, Tan PH. Is triple immunostaining with 34betaE12, p63, and racemase in prostate cancer advantageous? A tissue microarray study. Am J Clin Pathol. 2007 Feb. 127(2):248-53. [Medline]. Helpap B, Kollermann J, Oehler U. Limiting the diagnosis of atypical small glandular proliferations in needle biopsies of the prostate by the use of immunohistochemistry. J Pathol. 2001 Mar. 193(3):350-3. [Medline]. Strand CL, Aponte SL, Chatterjee M, Engelbach LM, Fromowitz FB, Guo Y, et al. Improved resolution of diagnostic problems in selected prostate needle biopsy specimens by using the ASAP workup: a prospective study of interval sections vs new recut sections. Am J Clin Pathol. 2010 Aug. 134(2):293-8. [Medline]. Iczkowski KA, Chen HM, Yang XJ, Beach RA. Prostate cancer diagnosed after initial biopsy with atypical small acinar proliferation suspicious for malignancy is similar to cancer found on initial biopsy. Urology. 2002 Nov. 60(5):851-4. [Medline]. Merrimen JL, Jones G, Hussein SA, et al. A model to predict prostate cancer after atypical findings in initial prostate needle biopsy. J Urol. 2011 Apr. 185(4):1240-5. [Medline]. Ryu JH, Kim YB, Lee JK, et al. Predictive factors of prostate cancer at repeat biopsy in patients with an initial diagnosis of atypical small acinar proliferation of the prostate. Korean J Urol. 2010 Nov. 51(11):752-6. [Medline]. [Full Text]. Cheville JC, Reznicek MJ, Bostwick DG. The focus of "atypical glands, suspicious for malignancy" in prostatic needle biopsy specimens: incidence, histologic features, and clinical follow-up of cases diagnosed in a community practice. Am J Clin Pathol. 1997 Dec. 108(6):633-40. [Medline]. Iczkowski KA, Bassler TJ, Schwob VS, et al. Diagnosis of "suspicious for malignancy" in prostate biopsies: predictive value for cancer. Urology. 1998 May. 51(5):749-57; discussion 757-8. [Medline]. Scattoni V, Raber M, Capitanio U, Abdollah F, Roscigno M, Angiolilli D, et al. The optimal rebiopsy prostatic scheme depends on patient clinical characteristics: results of a recursive partitioning analysis based on a 24-core systematic scheme. Eur Urol. 2011 Oct. 60(4):834-41. [Medline]. Ploussard G, Plennevaux G, Allory Y, Salomon L, Azoulay S, Vordos D, et al. High-grade prostatic intraepithelial neoplasia and atypical small acinar proliferation on initial 21-core extended biopsy scheme: incidence and implications for patient care and surveillance. World J Urol. 2009 Oct. 27(5):587-92. [Medline]. [Full Text]. Warlick C, Feia K, Tomasini J, Iwamoto C, Lindgren B, Risk M. Rate of Gleason 7 or higher prostate cancer on repeat biopsy after a diagnosis of atypical small acinar proliferation. Prostate Cancer Prostatic Dis. 2015 Sep. 18 (3):255-9. [Medline]. Brimo F, Vollmer RT, Corcos J, Humphrey PA, Bismar TA. Outcome for repeated biopsy of the prostate: roles of serum PSA, small atypical glands, and prostatic intraepithelial neoplasia. Am J Clin Pathol. 2007 Oct. 128(4):648-51. [Medline]. Leone A, Rotker K, Butler C, Mega A, Li J, Amin A, et al. Atypical Small Acinar Proliferation: Repeat Biopsy and Detection of High Grade Prostate Cancer. Prostate Cancer. 2015. 2015:810159. [Medline].